There are plenty of wonderful reasons to update your bathroom decor. Perhaps you could just use a slight change of scenery to spice up your life, or maybe you're hoping to sell your home in a few years and want to upgrade the amount of money you can expect to make back. Then again, maybe you just like the idea of having a truly outstanding bathroom. But this leaves the question of what are the best ideas a person could use for a bathroom upgrade? 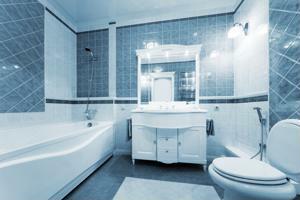 Do improvements need to be as potentially time consuming as installing a new bathroom vanity? Or could simply purchasing new shower curtains or towels do the trick? Many experts have chimed in on the matter. Both Elle Decor and Good Housekeeping advise readers to think about putting new tiles on the walls and floor of bathrooms both large and small. The latter source calls tiles "trendy" and notes that they're an easy way to add various colors to the room without being too overt about it. That isn't to say getting a color theme going with your bathroom accessories is necessarily a bad idea - but such a color scheme may be a little less subtle than tiles. Then again, subtlety isn't for everyone, especially when it comes to decor. Some people don't necessarily put much thought into how their showers are designed, but there are plenty of interesting spins many experts have put on shower heads, as pointed out by Elle Decor. Decor professional Darryl Carter told the source about his fondness for "time honored" styles, such as European-style exposed showers. Another idea would be to implement a hand-held shower head. While it might be a bit more work to use, you'll also probably be able to aim it at areas of your body that may need a more precise cleaning. Decorative creativity for the shower also applies to bathtubs, as Elle Decor knows well. Specifically, the source displays a traditional claw-foot tub. Many people assume bathtubs and showers need to be one-in-the-same, but designs like the claw-foot tub are meant to be bathtubs alone, and placed in the center of the room when possible. Whether or not it's a convenient method of design is a matter of subjectivity, but an antique bathtub in the middle of the bathroom may surely add some class and panache to the scenery.